Hope everyone had a great Thanksgiving. Seems like the holiday that never ends, until the leftovers are gone at least. We were lucky to get great weather of Thanksgiving week for getting out and doing some fly fishing. Our annual Thanksgiving fly fishing trip benefited for it. For the past few years this annual trip has been held on the Big Horn River, and we have seen it all weather-wise. Great way to always close out the fly fishing season. We changed it up this year and headed north to the Missouri River. No complaints. Good fishing and good food with good friends. Closer to home in Bozeman, MT fly fishing has continued to be good thanks to consistently good weather. 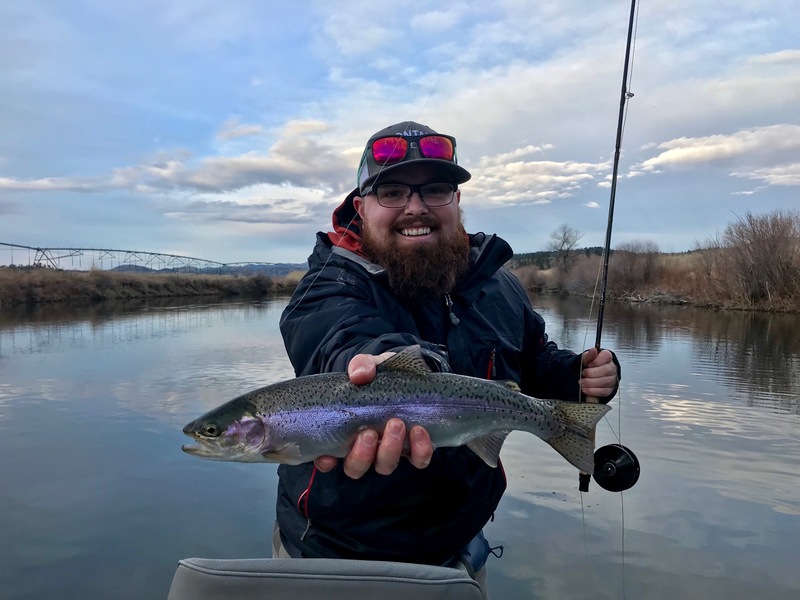 We had the pleasure of guiding some late-season anglers last week and even found a couple fish that wanted to eat dry flies. Hard to beat dry fly fishing in November. From here on out until next spring, weather will largely dictate your fortune. Also look for our Bozeman fly fishing reports to become more sporadic. Look for a winter fly fishing forecast coming up to summarize what to expect all winter long. Winter tip: Boat ramps are starting to get snowy/icy. Best to check both put in and take out ramps before floating. Still fishing well. Nymphing and streamer fishing will be a fly anglers best bet. Our guides like getting out of the boat and wade fishing deeper, slower runs once water temps start to drop. No need to get too technical out there. Pats rubber legs, worms, lightning bugs, and zebra midges should be about all you need. For a while. Flashier, bright buggers will be the best bet for the streamer crowd. Good to great fishing on the spring creeks the past few weeks and look to fish well as long as the weather keeps things pleasant. Midges and very small blue wings still hatching. Nymphing in the morning and dry fly fishing the early PM has been productive. Our fly fishing trips based out of Bozeman, MT this winter all center around fishing on DePuy’s and Armstrong’s Spring Creeks. Solid fly fishing. Getting cold on the Yellowstone River but still some good fishing to be had. Nymphing will be your best bet. You will catch many a whitefish per trout but nothing wrong with bending rods. Pats rubber legs and wooly buggers followed by a lightning bug or zebra will be a good starting point. Look to the middle of the river in slower water for the best bite. Still great. Nymphing at Holter Dam down through Craig has been solid. Sowbugs, firebeads, midges, Czech nymphs, and lightning bugs are all you will need. Lots of the trout spey crowd out on the river. Saw a few hooked up. Picture at the top was from last week. Good friend and angler Kevin had a nice evening dry fly session. Surprising number of fish still looking up. Closed for season. Check back in May 2019.